E-Luminate, a digital offering that draws on extensive agronomic data, helps farmers make more informed seed-selection decisions. 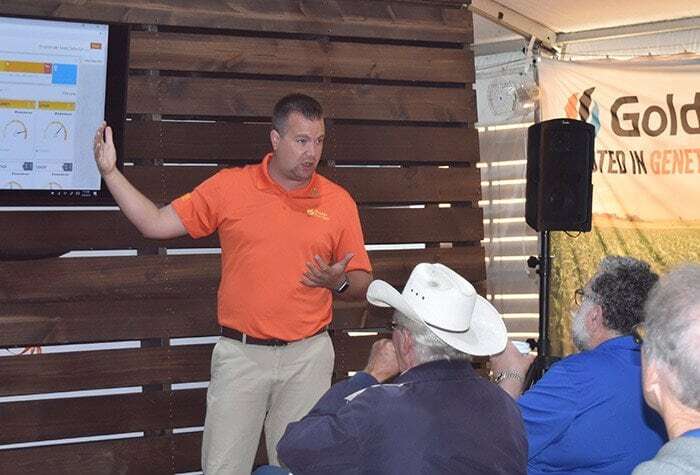 Jack Brodshaug with Golden Harvest demonstrates the E-Luminate seed-placement tool to media attending the 2018 Farm Progress Show. Golden Harvest has announced the rollout of E-Luminate®, an exclusive digital offering that draws on extensive agronomic data to help farmers make more informed seed-selection decisions. This unique seed-placement tool is available to Golden Harvest® Seed Advisors for use in the field. It allows them to have field-level discussions with their customers around selecting the right seed, based on key agronomic factors, including soil characteristics and pressure from weeds, diseases and insects. Powered by the precision of statistical analysis, recommendations using E-Luminate reflect actual performance comparisons across varieties by year and region, with results appearing in a visual dashboard that compares and contrasts seed varieties. To learn more, contact your local Golden Harvest Seed Advisor.